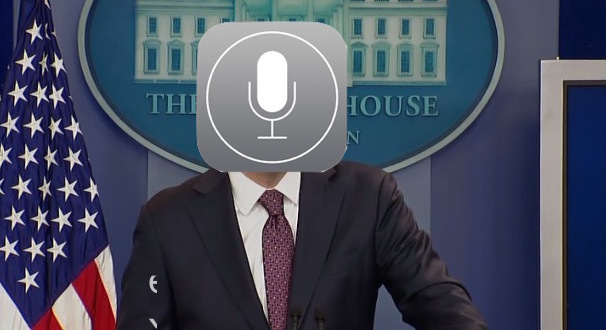 Watch the video to get the whole thing, but the gist is that during a White House press briefing, a reporter asks the White House Press Secretary Josh Earnest a question about the Iran nuclear deal and whether President Obama would be bothered about the Republican response, which is then answered by someones iPhone with Siri saying “Sorry, I’m not sure what you want me to change.” – Quite funny, and as is so often the case with Siri talking out of the blue, the answer is strangely relevant to the conversation. This is a pretty funny video that nearly all iPhone owners who have experienced the weirdness of Siri should be able to relate to. So why does this happen? In this case it sounds like a reporter or someone in the room accidentally (or maybe intentionally) pressed on the Home button to summon Siri as usual, as you can hear from the little Siri is listening chime… to which Siri then answers the very question the reporter asks. But in other occurrences, what triggers Siri talking out of the blue is the Hey Siri voice activation feature which allows you to summon the virtual assistant just by saying the phrase “Hey Siri” followed by a question. Perhaps not the case in this example, but it’s a good laugh anyway. Who needs PR when you have Siri, right?. It’s funny because Siri’s answer is basically what the press secretary would say about the deal anyway! Try turning on Siri during the TV news when there’s a piece about Syria… she gets very chatty! And the iPhone 6s includes always-on “Hey Siri”, it’s going to have a lot to say very soon! Your Syria references have offended me. Hey, let’s not insult the Onion. While they lack the cleavage offered by Fox News, They are more accurate and a lot funnier. Anyway, it is a funny video! That’s how I read the joke too, a joke about the lack of humor in the media. I enjoyed the clip, thank you. I wish we all had more sense of a humor, especially with politics, which everyone takes too seriously nowadays. You want us to ignore the political part, but then demean fox news by calling it the onion? Also, nobody serious takes Fox News seriously. If you actually get ‘news’ from Fox News you might as well watch Pravda in Russia too. Pure propaganda outlet for a radical political ideology and political group. I bought mine in Germany. At the time Samsung offered no out of region customer service. I tossed the damn thing in a drawer, and bought my first iPhone because of that crazy voice assistant.